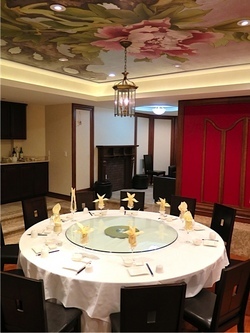 One of Leader House’s private dining rooms. Photo: © tablehopper.com. Back in December, I did a pretty extensive profile on an opulent Chinese restaurant that was about to open in the Payne Mansion on Sutter Street, ~LEADER HOUSE~. Employees were being trained, the menu was ready, launch parties were lined up, and then boom, the place closed. It was supposed to be a temporary closure, but now here’s the official word from one of the partners in the project: “The Leader House project is on hold. We are currently looking for partnership to run the restaurant and hotel, or lease out the whole building.” The space is totally magnificent—here’s hoping someone comes on board. Meanwhile, I’m just going to be bummed the Hunanese dishes I experienced at a preview lunch was one time only—the food was so good. Sigh. 1409 Sutter St. at Franklin, 415-352-2222.